Traditional architecture seen in Seoul’s Bukchon Hanok Village. 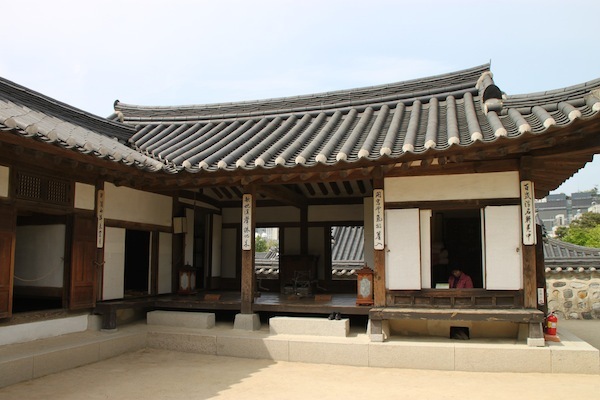 SEOUL, South Korea — The Korean word hanok refers to a traditional Korean house. I had occasion to see the houses during a recent press trip to Seoul and other Korean sites, sponsored by the Korea Tourism Organization. 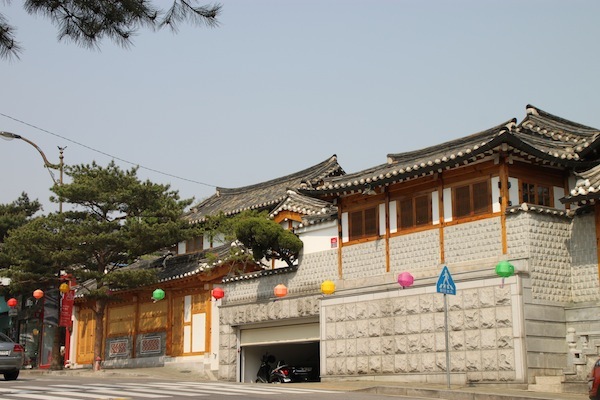 The Bukchon Hanok Village is a Seoul neighborhood known for these houses. 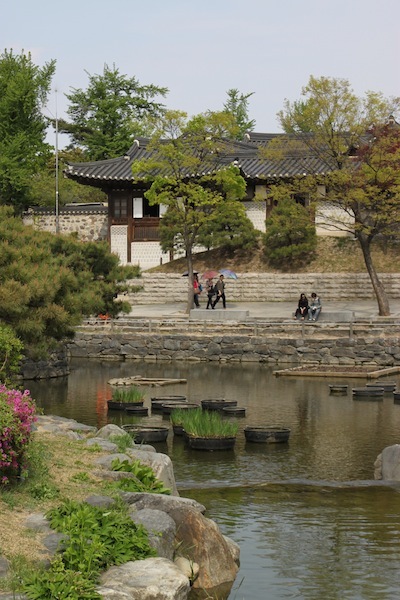 Tourists are drawn to the area to see the houses and for Bukchon’s galleries and artsy workshops devoted to traditional arts. We had a guide for our stroll — a stroll that was more like a forced march (that is what learning trips for the press are like) up and down hills on narrow streets to look into shops and view picturesque streets. This replica of a 1910 home shows how effectively wood was used to create a structure both sturdy and attractive. 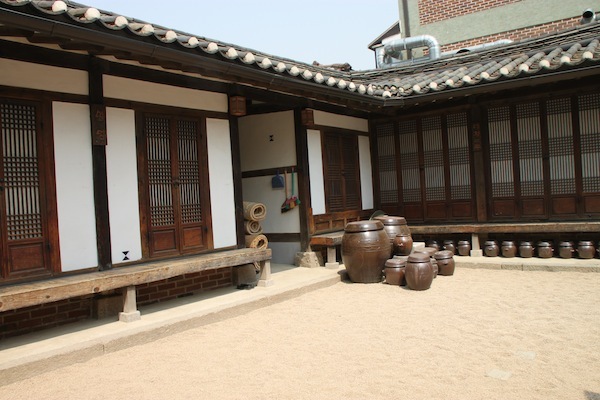 This visit started at a large house that is used to show tourists what a typical hanok looks like. According to our Bukchon host, this area was redeveloped in the early 20th century with houses that were built using old construction methods. So, locals consider this area new although it has the look of something that could be older. Hanoks feature small rooms that face courtyards covered with sand, not grass. Our hostess said grass is associated with the dead, whereas the sand assists with water drainage and reflects light, bringing the light into the homes, which have deep eaves to block direct sun in summer. A courtyard in the model house that tourists visit in Seoul’s Bukchon Hanok Village. The raised floor leaves room for under-floor heating. Floors inside these homes are constructed to accommodate fires underneath for heat. 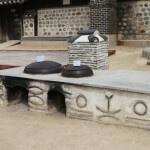 Our hostess said the style of these houses came from China “long ago,” but the concept of under-floor heating is Korean. Even today, she said, apartment buildings have under-floor heating. We dropped by one Bukchon gallery/workshop with paintings, plus other artsy objects (braziers of steel but inlaid with silver, for example) and briefly watched a potter at his work. In another shop, we were offered tastes of rice wine that, I gather, was made based on traditional ways. 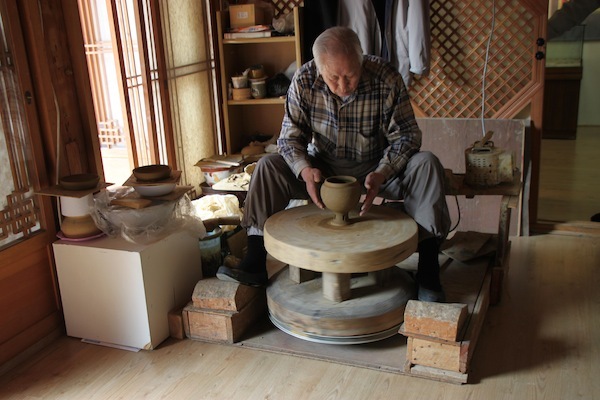 A potter demonstrating his skills at a workshop in Seoul’s Bukchon Hanok Village. At the area’s Folk Painting Workshop, we tried our hand at painting small lotuses or peonies on coasters. Fortunately, we were coloring in established lines, but with paint and brushes. 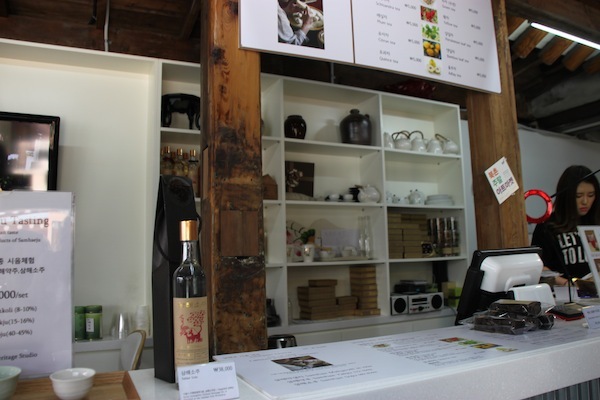 A rice wine tasting site in Seoul’s Bukchon Hanok Village. This was the finale to our too-short visit to this nice-looking area. The Bukchon Hanok Village is worth considerably more time. We had a free afternoon in Seoul, which I used for a solo visit to another collection of hanoks. This required conquering — after a fashion — the subway system. I only had to travel a couple of stops on one line. The two stations I saw were huge with numerous exits and with charts identifying the street or attraction that each exit led to — and the information appeared in English as well as Korean. Thank goodness for that system! It let me exit the underground maze at the right place and, thus, avoid being totally lost once I was on the street. Instructions for buying tickets are available in English and there is a surcharge (about 50 cents) for buying single paper tickets. One can pay about $2.50 for a refillable plastic card and avoid the surcharge after that. This reminded me of a similar concept in the Washington, D.C., metro. Anyway, for my two rides, the plastic card did not make economic sense. I asked for help a couple of times while underground, and the young women I approached were able to divine my needs and respond sufficiently well. All of this delivered me rather quickly to the Namsangol Hanok Village, a fabrication in the city center created in the 1990s by moving historic (and usually 19th century) buildings from other points in Korea; also, one house is a replica. There is no entry fee to see the village, which is essentially a park, a quiet spot in the heart of a city of 11 million. 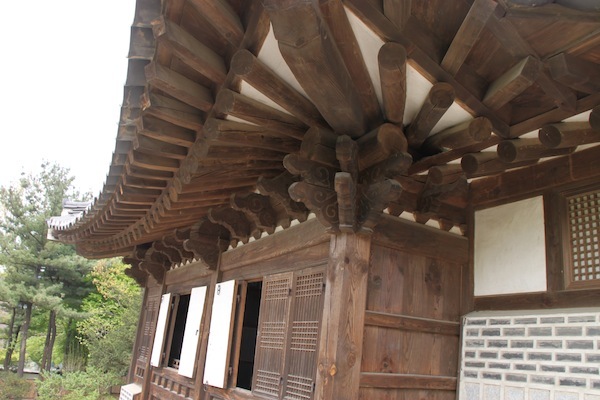 View of an 1890s-era house in Seoul’s Namsangol Hanok Village. The raised floor leaves room for under-floor heating. The village installations are walled compounds, which had belonged to reasonably well-to-do people, with courtyards surrounded by small sitting, reading and sleeping rooms, plus there were kitchens, some shrines and secondary buildings. 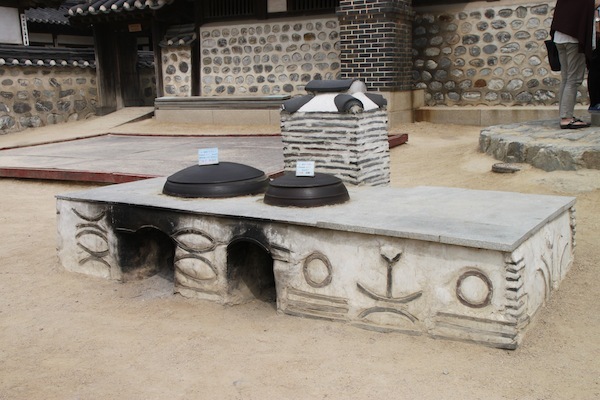 This display at Namsangol Hanok Village illustrates a traditional way of cooking. out of the rooms and hence off the wooden floors. However, in the fifth house I viewed, it appeared several visitors had rented traditional costumes in order to be photographed in them, and this was occurring mostly inside the house. 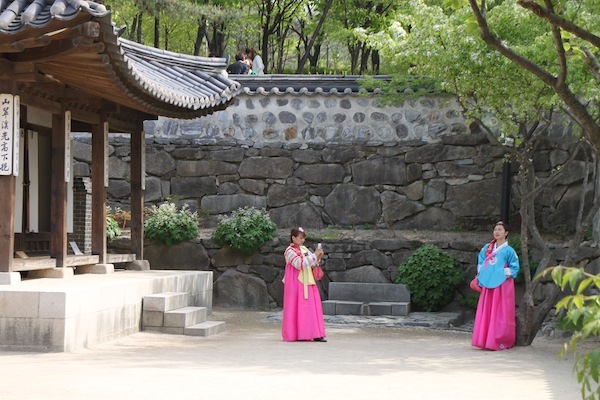 Women in rented traditional Korean dresses enhance the look of traditional homes in the Namsangol Hanok Village. Visitors can try their hand at a traditional game, tossing arrows into a narrow-necked jar. 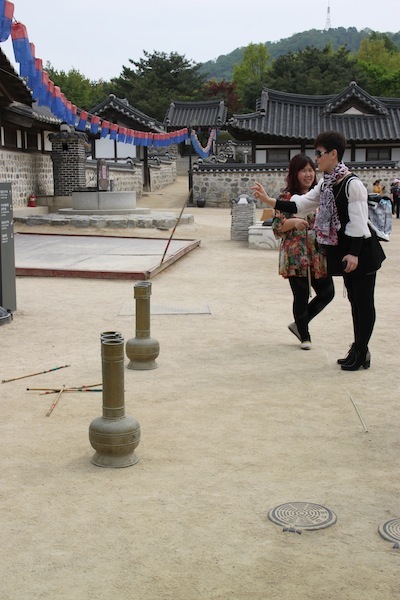 Visitors to Namsangol Hanok Village test their skills at an old Korean game that involves tossing arrows into a narrow-necked jar. A pond on the grounds of the Namsangol Hanok Village. see examples of this; handmade traditional goods are sold here, too. Namsangol was very popular when I visited, but as far as I could tell, it’s not a top spot for foreigners; most visitors seemed to be Korean.